It has been a couple of weeks since I posted something on the blog related to the direction the stock market was headed. If you recall, on that last post I noted that we were due for a bounce higher off the October lows – which we got – and a potential retest of those lows before heading higher – which we may be in the process of achieving right now. After a retest, I noted there was the potential for a move back higher going into year-end. The graph above is a version of one that I have had on the blog previously during times of higher volatility. I thought it would be interesting to look at it again when I was reading Lance Roberts blog and he showed his version of it. Lance goes into additional detail on small caps and mid caps, while I am going to stick with the large cap S&P 500 Index. Lance also uses fewer indicators than I do, but its remarkably similar. > The red squares are times when there was a trend change but only two indicators confirmed it plus there are red arrows showing the indicators that contradict it. For an indicator to confirm the trend change, it must cross either the limit line (as with the Williams % Index, the McClellan Summation Index, and the Rate of Change of the VIX) or cross an indicator trend line (as is the case with the MACD). In my system, the greater the number of confirming indicators, the more intense the move up or down in the market will be upon change of trend. The trend change with the green circles is easy to see and can reliably tell you that you need to either get more aggressive in your investing because the market has changed to an intermediate trend higher or more conservative because the market has changed to an intermediate trend lower. You will notice the two green arrow on the lower left. The one furthest left shows a move of the indicator above the upper blue limit line, but a move below it prior to the other indicators showing that there is trouble brewing and forecast a downturn in the trend. The second green arrow shows you that when the other indicators confirm the trend change, this one had already moved below the limit line. 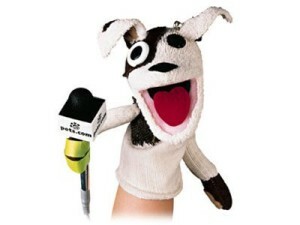 That downturn ended up being the NASDAQ dot-com crash and the 911 market crash – if you had followed what the indicators were telling you, then you would have gotten conservative by raising cash so that you had liquidity available to buy quality companies (hint: NOT pets.com which is one of the more famous dot.coms to go bust). Indicators are not perfect. The dot-com crash was indicated by the change in trend, but the 911 terrorist attacks happened without warning and there was no possible way for the indicator to show that dire of a situation was at hand. This should have been a situation where we used a pink circle, and if it was some other economic event that had some warning we likely would have seen it in the indicator. 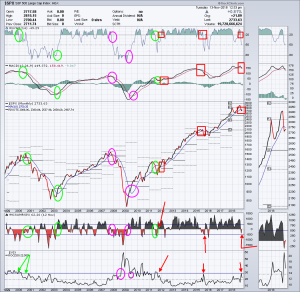 The pink circles show you when the trend change was confirmed by all four indicators – and when that happens – a fairly infrequent occurrence – you should be prepared for a potentially major move that takes the trend materially higher or lower. We discussed the dot-com/911 crash above that should have been circled in pink, but you also see the subprime mortgage crash of 2008 circled in pink along with the subsequent recovery that has led to a nine-year bull market with minor corrections along the way. 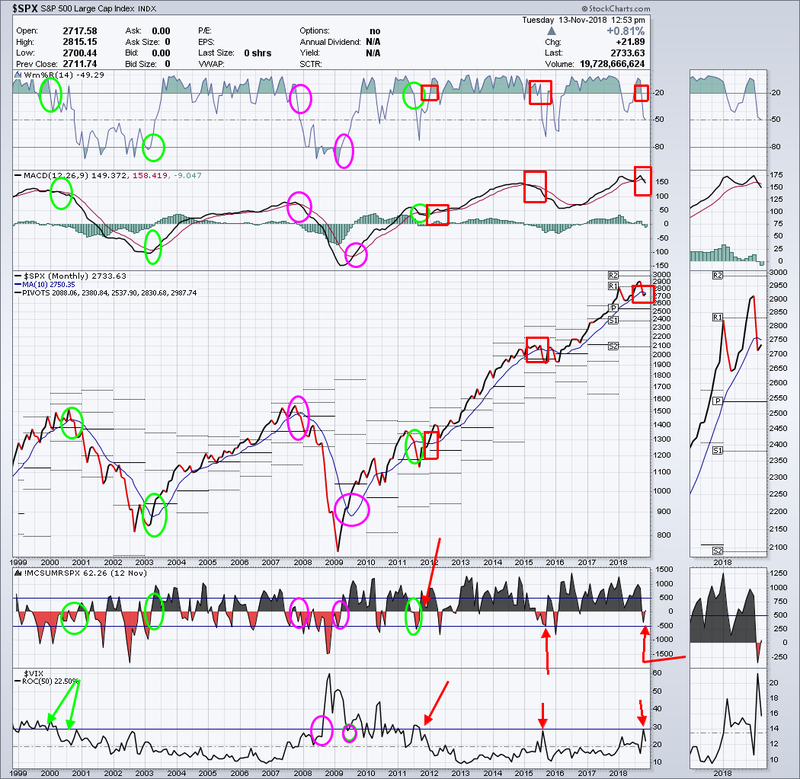 The red boxes denote trend changes with only two confirming indicators. These tend to be less severe than either those with three or four confirming indicator. I’ve added red arrows to show the non-confirming indicators to show that they did not cross their limit lines when the trend change happened. You might be able to discern that the trend changes are short-lived and shallow in these cases compared to the pink and green sets which have larger and longer moves. So, what does this tell us about right now? On the far right of the chart I’ve used red boxes to show where we are now (in retrospect, I should have used another color or shape to separate them from the two sets of red boxes to their left). You can see that we had a trend change on the price graph, with the black index line crossing downward over the red trend line. We also had a confirming signal in the upper-most panel showing the Williams % Index crossing below the upper limit line and the MACD crossing below its red trend line. However, the Summation Index (the red and black area graph) has moved back into positive territory (just barely) and the Rate of Change on the VIX never was able to cross above the blue limit line. Based upon the readings as they stand right now, it looks like the current correction should begin to head higher again after a potential retest of the lows from October. The key index price to watch is 2603.54, which was the low in the month of October. If we can close out November without breaching that low, then we have made the first monthly “higher low” and that could lead to a rally into year-end. If we breach the October low in the next two weeks, then we are likely headed back to the February lows of 2532.69 on the index. If that doesn’t hold, then we are looking at 2380 as the next support level on this index which would put us squarely in bear market territory. If we do rally into year-end, we have several layers of resistance at 2751.71, 2761.98, 2822.44, 2899.89, and 2939.86. If you listen to the investment gurus that appear on TV, most are predicting a year-end rally. I don’t know exactly what they base that on – they don’t ever disclose the indicators they follow nor how those indicators have acted over the years – but let’s hope they are correct and we are on the road to higher stock prices. Investor sentiment is negative at the moment, but until we get three or four of the indicators to confirm the trend change, it appears to be a normal pull-back at the present time. If we see further confirmation of a correction, I will let you know here on the blog. Williams % Index: a momentum indicator that tells us whether investor buying is increasing or decreasing. When investors are committing money to the market, that is the time to get more aggressive as they are likely to be driving prices higher. MACD: A momentum indicator based upon two trend lines, when momentum is slowing the trend is weakening and visa versa. This is a very traditional indicator that is widely used and consistently helpful in providing a buy V sell signal. Summation Index: a breadth indicator that shows the cumulative difference between stocks going up V stocks going down in price. In a downtrend, if the cumulative difference turns positive, that means in spite of what is happening in the index, individual companies are starting to come out of the correction and the index should follow suite soon. The opposite is true in an uptrend when the cumulative difference turns negative. 50-Day Rate of Change of the VIX: the VIX is a volatility indicator based upon the buying and selling of options. I use the derivative Rate of Change to smooth out the daily gyrations and to show the velocity of the volatility in terms of whether it is increasing or decreasing. The limit line is subjective but over the years I have grown comfortable with the level I use to tell me whether to get more conservative or more aggressive. This entry was posted on Tuesday, November 13th, 2018 at 4:27 pm. You can trackback from your own site.